With Membership at the heart of the organization, NAfME acts as the voice of music education and delivers resources, products and services in support of its mission. Active Educator – An individual membership, open to full-time teachers/faculty (most music educators fit into this category). Active members receive all benefits provided by your federated state music educators association. Introductory Membership – Introductory membership shall be open to individuals in their first year of full-time music teaching or other music-related education work who have been collegiate members during the preceding fiscal year. Collegiate – An individual membership, specially-designed for college students . . . our future music educators! Collegiate members receive all benefits provided by your federated state music educators association. Retired – An individual membership, open to former full-time music educators. Retired members receive all benefits provided by your federated state music educators association. Associate – An individual membership, open to music education assistants, private teachers, seasoned performers, and others interested in supporting quality music education. Those who are primarily engaged in music teaching do not qualify for this category. Also note that federated state music educators association benefits are not included in this category. Corporate – This is a group membership, and allows our industry friends to support NAfME programs while also benefiting from access to information and prospective customers. Tri-M – Membership in the Tri-M Music Honor Society is perfect for middle school and high school students who wish to expand their knowledge and benefit from the recognition this national program provides. Need more information on the benefits? Take a membership tour! Whether you are a seasoned professional or new to the profession, an applied music specialist or a general music teacher, we advocate on your behalf 24/7. And we have a place for you. 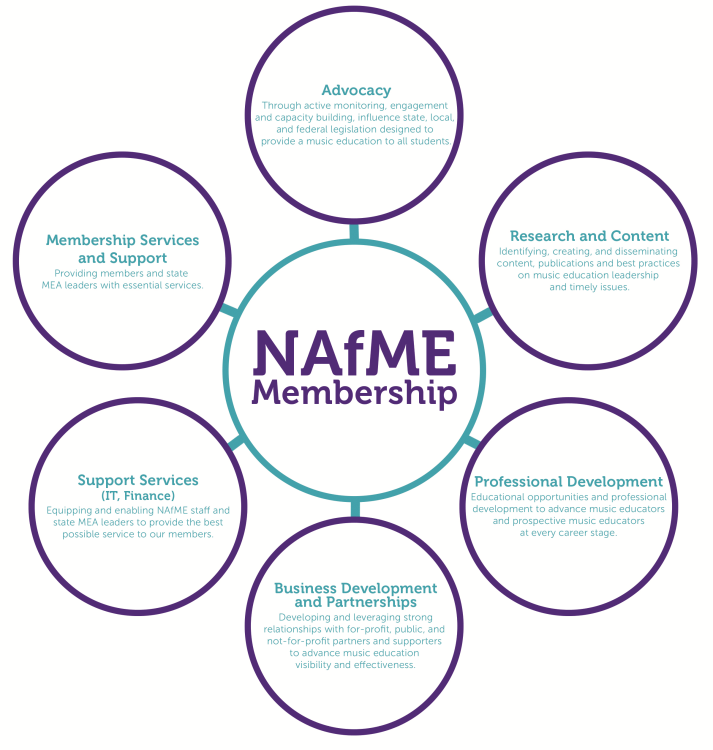 Join your fellow music educators as a member of NAfME today!